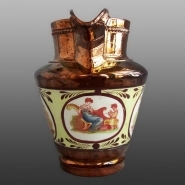 An earthenware copper luster jug with an Adam Buck inspired print of the well- known Battledore and Shuttlecock pattern. A second Buck type pattern, that of a mother and child, is printed under the spout. Both patterns are printed and painted over the glaze. Shown here is the pattern printed under the spout of the jug.